Independent film icon, Robert Rodriguez, began his career by creating his first feature film, EL MARIACHI, on a budget of only $7000 with only 14 days to shoot. That creative endeavor began his journey to become one of the premier independent filmmakers of this day. 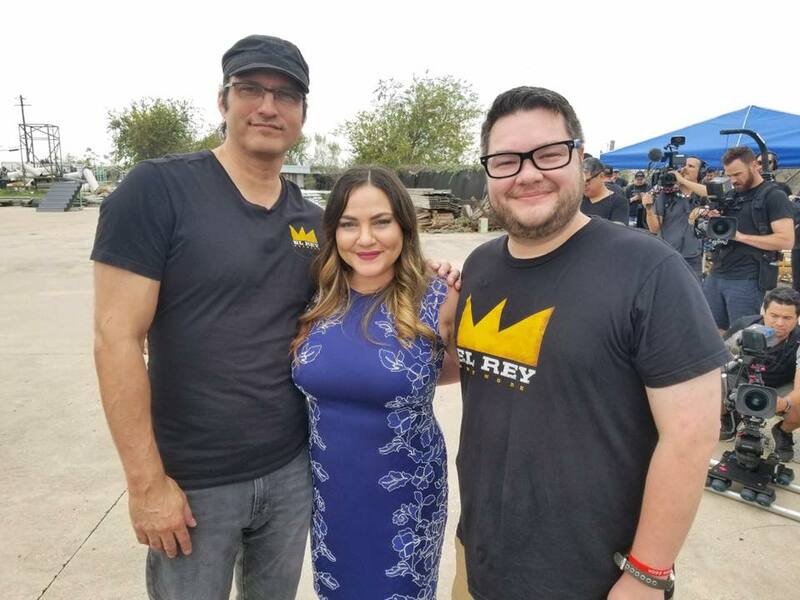 Now, Robert Rodriguez is giving back to the independent film world with his new documentary series, REBEL WITHOUT A CREW: THE SERIES. Alejandro, along with 4 other filmmakers, were recently selected to be a part of the first season of this new documentary series. With a budget of $7000 and only 14 days, Alejandro was challenged to shoot his own feature length film. After spending the month of October in Austin, TX, principal photography was completed on MONDAY, the feature film based off Alejandro's critically-acclaimed and award-winning short of the same name. MONDAY is currently in post-production and is slated to have its premiere at the 2018 South by Southwest (SXSW) Film Festival. REBEL WITHOUT A CREW: THE SERIES will air on Verizon Media’s go90 and the Rodriguez-led El Rey Network. "LESLIE" is an official selection of the 2017 SOHO International Film Festival. "LESLIE" will be screening on Saturday, June 17th at 1:40pm EST as part of the "#SOHO8 Shorts: 'Prince Street Stories'" block of short films. If you're going to be in the area, click here to buy your tickets today and support independent film. MONDAY is still going strong and will screen during the New Mexico Shorts Block of the LAS CRUCES FILM FESTIVAL on March 11th. MONDAY will also be heading to the bright lights of Atlantic City and screening at the GARDEN STATE FILM FESTIVAL. March is a big month for LESLIE. On SATURDAY, MARCH 11TH AT 1PM, LESLIE will be screening alongside other incredible New Mexico short films during the NEW MEXICO SHORTS BLOCK at the LAS CRUCES FILM FESTIVAL. The cast and crew of LESLIE are also incredibly proud to be screening at the TCL Chinese Theatre in Los Angeles, CA for Hollyshorts Film Festival. Showtime is Thursday, March 23rd at 9:30pm. Click below to get your tickets. The short film MONDAY has officially been selected into both the Santa Fe Film Festival and the Filmstock Film Festival in Arizona. We can't wait to screen MONDAY for a new audience and we're hoping for a packed house at both screenings. We don't have official screening times as of yet but we'll let you know when they are announced. We are also very pleased to announce that the pilot for THE JONESES is finally complete and we're incredibly excited to premiere it at the 2016 Santa Fe Film Festival. The first and only screening will be on Sunday, December 11th. Time is still being determined but we'll let you all know as soon as we do. LOW/FI is still going strong! We recently screened at the 1st Annual Stage 32 Short Film Competition in Los Angeles to a very enthusiastic crowd. In other news, THE JONESES is in the final stages of editing and we're really looking forward to getting this out in the world for all to see. And finally, LESLIE, the latest short film from Alejandro, is currently in post-production. Be on the lookout for our new website and Facebook page to stay up-to-date on all things LESLIE. We're really excited about this project. We're really excited to announce that LOW/FI will be screening once again at the famous TCL Chinese Theatre in LA as part of the Hollyshorts Film Festival. If you're in Los Angeles, you should check out LOW/FI in an amazing block of short films playing Friday, August 19th at 6pm. LOW/FI is also screening for the first time in Austin, TX at the Austin Revolution Film Festival where it is nominated for Best Comedy. The filmmakers are hitting the road and will be in attendance. The incredibly talented Kristen Rakes has also been nominated for Best Actress. The Austin Revolution Film Festival runs from September 20th - 24th. As soon as we know the official schedule we'll be sure to let you all know when LOW/FI is screening. And from one performance to another, THE JONESES, starring Kristen Rakes and Matt Page, is currently in the editing room. "We are on sound editing and perfecting the pilot... people are gonna have a blast with this one," says Co-Writer/Director Alejandro Montoya. Mexico Screenings a Huge Success! New Short Film Coming Soon! Early last month, Alejandro was honored to screen LOW/FI, Monday, The Joneses, and The Princess and the Musician in Monterrey, Mexico. After a whirlwind of interviews, we are pleased to announce that his collection of shorts played to a packed house (80% Capacity) to incredible acclaim. We're also pleased to announce that MONDAY has been chosen as an official selection at the BIG RIVER FILM FESTIVAL in Savannah, GA. MONDAY will be screening alongside many amazing films including HELL OR HIGH WATER starring Chris Pine, Ben Foster, and Jeff Bridges. Finally, we're incredibly excited to announce that production on Alejandro's latest short film, LESLIE, will be starting soon. May 27 2016 - LOW/FI recently screened at the amazing Roswell Film Festival and was incredibly humbled to come away with three big awards: BEST ACTOR, BEST EDITING, and BEST DIRECTOR. Alejandro is also incredibly excited to be screening his short film collection (Princess & the Musician, Low/Fi, Monday, The Joneses) in Monterrey, Mexico on SATURDAY, JUNE 4TH. Information about this FREE screening can be found by CLICKING HERE. Finally, on SATURDAY, JUNE 25TH, Alejandro will be hosting a Professional Video Audition Session*. This event will include reader and direction from award-winning director Alejandro Montoya Marin for a finished 1 -2 minute, submission-quality video monologue. Your recorded monologue will be professionally produced and recorded and will be an incredibly valuable tool for aspiring and experienced actors alike. For more information, please CLICK HERE. Spots are limited so please don't wait. *Disclaimer: This video audition session is NOT for consideration for casting purposes by the director. The coaching/direction is provided for training purposes and the end product (video) is provided as an actor's own promotional marketing resource.